1. Preheat the oven to 180°C, gas mark 4. Peel and core the pears and cut a slice from the base so they sit upright. Rub each with 1 tsp lemon juice to prevent browning, then stand up in a dish small enough to fit them snugly. Drizzle with 2 tbsp honey, dot with 20g butter, tuck the rosemary sprigs and pared lemon zest around them and finish with the remaining lemon juice and 1 tbsp water. Cover with foil and bake for 30-35 minutes, until the pears are soft, but still hold their shape; set aside. 2. Melt the remaining 10g butter in a frying pan set over a low heat. Gently fry the pine nuts, stirring often, until deep golden. Drain on kitchen paper. 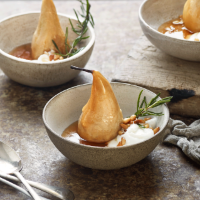 Put the pears in serving bowls and drizzle over the remaining 2 tbsp honey and juices from the tin. Scatter over the pine nuts and serve with a spoonful of Greek yogurt, plus fresh sprigs of rosemary, if liked.